The Irish American Orthopaedic Society is a professional organization for orthopaedic surgeons who are Irish, of Irish descent, or have trained in an Irish University. Through cooperation with other Irish American organizations and by building positive relationships with medical colleagues across the Atlantic, the Association strives to celebrate our rich Irish heritage while expanding orthopaedic knowledge, fostering goodwill and cooperation, and bettering the lives of those we reach. A thoroughly enjoyable review of some letters written by Jimmy Devlin to, and about, some other Founding Fathers of our Irish American Orthopaedic Society reveals the character, drive, foresight, and bountiful wit of the good doctor. These poignant sentiments could well serve as a mission statement for this organization. The following are some excerpts from his writings around the time of our establishment. There should be no fee or rigid protocol. But we should aim for a strong and enthusiastic group anxious to expand the proven and decry the untested and useless. Let us not be short in foresight but even more, let us avoid where possible, "Hindsight is better." We all know that there are more medical societies in the world than are needed. Many of these contribute little or nothing to the advancement of the science, expansion of the art, or understanding of the artisans. By many, it is felt that an Irish American Orthopaedic Society should be formed at this crucial time in a world of great poverty, strife, and in dire need of basic orthopaedic care. If it were done when "tis done," then it were well "twere done quickly." An inaugural meeting was held on Saturday, February 25th in the largest meeting room in Texas. A standing welcome was given to all present. The meeting was held in the hallway outside the auditorium and there were no chairs. The affair was strictly sober. The meeting was understandably short! There is a burning desire to place Irish residents in an American Orthopaedic program for one year of their training. 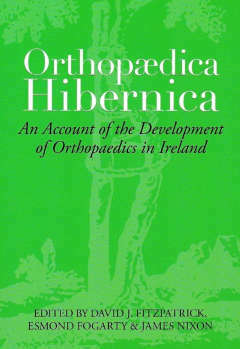 This would help the Irish resident and future orthopaedist to a significant degree. Joe Flynn has offered to help in any way possible and I am asking him to be coordinator of the educational program. So if you have a burning idea, kindle it, immerse it in Florida, and then let's relish it in Ireland. Everyone who has talked or written has been enthusiastic and some have offered whatever help possible. Michael Browne will co-pilot this limb bud with me. We promise to leave no BONE unturned in the development of a successful organization. Jimmy Sheehan will be the SPINE of the Irish group, both North and South. This may bring him to his knees but should they wear out, he has a substitute for that.